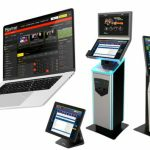 Sports Betting Terminals When we say – Sirplay is the gaming solutions expert providing the best – we mean we also do it for your Betting shops. Our retail betting terminals are designed to be All-in-One Solutions with a printer, a POS, an Android System and our Betting Software Ready-to-Go. They can fit in your palm, which means they are perfect also for the smallest betting shops. Bitcoin Sportsbook Software The Crypto Era has arrived. Nowadays, Bitcoin is a fully-fledged currency, counting millions of active accounts spread all over the world. So why don’t give the chance to your players to bet with Bitcoins? Sirplay gives the chance to all the most innovative bookmakers to start their Bitcoin sportsbook software. White Label Sportsbook The white-label solution is a fully managed sportsbook. The utility of this kind of solution is the fastness in creating and delivering the website, indeed our staff can set up the website in ten working days according to customers' requests and proceeding towards building a custom-tailored sportsbook website. Video slots With a huge choice of themes and types of slots, SBS counts about 100 among flash casino slots and table games. Betting management Betting management clean and simple to use, extremely fast, tons of options inside, advanced tools and Real-Time bet accept reserve, based on the gaming traffic. Virtual Games It doesn’t matter if your betting software is online or land-based, it can’t be considered complete without the Virtual Games module. Online Poker Sirplay offers an online poker module that includes online poker games like Texas Hold'em and Omaha but also instant games with no need of installation. DFS – Daily Fantasy Sports Daily Fantasy Sports, DFS platforms are the booming news in the e-gaming industry. Thanks to its simplicity and variety it's quickly becoming a milestone. Bitcoin Bitcoin is the new method of payment to manage the outcomes of your sportsbook platform in an even safer, faster and more cost-effective way.